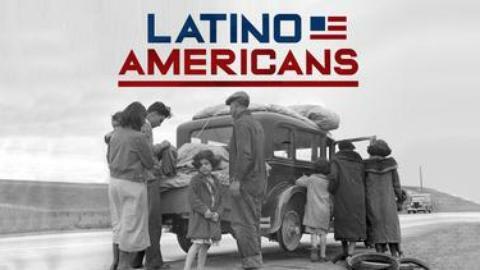 Latino Americans tells the story of Latinos in North America for the last 500 years. The series has received mixed reviews from activists and Latino leaders. The new documentary series, Latino Americans, will air on PBS and V-me television starting in late September through October to coincide with Hispanic Heritage Month. It is a sweeping three part; six hour look at 500 years of Latino history in the United States. As is usually the case with such an ambitious project, the results are mixed. This is mainly the result of the fact that television has neglected the subject for so long that it winds up with a project such as this one, trying to cram way too many of a rich and diverse experience into one documentary. The results are a sometimes disjointed and uneven narrative with terrific production values. To promote the documentary’s educational value, there is a companion book that fills in some of its gaps by Ray Suarez, Latino Americans: The 500-Year Legacy That Shaped a Nation. In presenting the history of and challenges confronting Mexicans, Puerto Ricans, Cubans, Dominicans and Central and South Americans in the United States, the treatment of Latino Americans in each of these communities ranges from the detailed to the cursory. As the largest Latino group by far, it is appropriate that Mexican-Americans get the lion’s share of the attention and more detailed treatment. On the other hand, while the Cuban experience is also well developed that of Puerto Ricans, Dominicans and Central and South Americans are are minimized. If anything, Latino Americans reflects the challenge of presenting the experiences of such a diverse community and doing so in a way that justifies doing so in pan-ethnic terms. How does one capture the common and specific essences of 52 million people stateside and almost 4 million more in Puerto Rico? The approach used was to present themes chronologically, interspersing the experiences of the specific Latino groups throughout. For some, this approach creates an overarching narrative, which for others may appear hard to follow as it skips around and sometimes lurches back and forth on each community’s historical experiences. Adding to these challenges is the goal of presenting this material in a way that is accessible to a broad audience. It opens with the episode, “Foreigners in their Own Land,” which covers the period 1565-1880 from the Spanish conquest to Mexican-American War that stripped Mexico of its territories in the Southwest. The approach used to open the documentary with some fairly dry historical reconstructions was unfortunate in that for many it will induce the sensation of watching paint dry. On the other hand, I am sure the Minute Men and other nativists will experience “Reconquista” chills. It was, on the other hand, interesting, in a pan-ethnic way, to see that two of the expert talking heads on this early Mexican-U.S. history were Puerto Rican journalists — Juan Gonzalez and Ray Suarez! One approach used in this documentary was to feature well-known celebrities, such as Rita Moreno, Gloria Estefan, Benjamin Bratt as the narrator, and literary figures like Julia Alvarez. This technique works at some points but becomes a crutch at other times as, for example, the treatment of the Dominican community, which is otherwise minimized. By viewing this community’s experiences through that of a single literary figure who by all means is not a “typical” Dominican, their story gets short shrift in the overall picture that is drawn. This unevenness is a problem in other ways. While much fascinating detail is presented on the Mexican-American experience in terms of its specific organizations, like the American GI Forum, the Southwest Voter Registration Education Project, the United Farm Workers Union, and others, this was not the case for the other communities. The Central and South American experiences were overly generalized given the many countries involved,. The role of important Puerto Rican institutions like Aspira and the Young Lords were not mentioned at all, despite, foe example, the employment of the ex-Young Lord and journalist, Juan González as a talking head, and so on. The treatment of the Cuban experience was, on the other hand, interesting. In looking at the Cuban independence movement, the Castro revolution, the Bay of Pigs invasion, the Cuban transformation of Miami, the Marielito boat lift, the Peter Panners(,) and the mainstreaming of the Miami Sound Machine, the distinctiveness of this community from other Latinos was made clear. The documentary points out the unprecedented degree of government support for the economic and political integration of Cuban refugees, which is a major difference in their experience in the U.S., compared to other Latinos. The documentary reports that this support, in part, generated an American backlash in the form of the English-only movement, giving the impression that they were patient zero in sparking this nativist campaign (which I am not sure is the case). As a counterpoint to the experiences of other Latinos, the Cuban example presented the positive role that government could play in promoting a fuller integration in this society’s economy, culture and politics. The irony, of course, is the political outcome of the Cuban community being the most supportive of a Republican Party that advocates limited government social interventions. That Latino Americans is a product of PBS, specifically their flagship WETA station, should not lead us to ignore their poor record in their relations with the Latino community. As I viewed this documentary’s World War II segments, it reminded me of the major battle our community waged with PBS over their sponsorship of the Ken Burns 2007 documentary, The War, that excluded Latinos, forcing him reluctantly to add a couple of segments on the Latino contributions to the war effort only after a major campaign by the Latino community. Efforts by major national Latino civil rights organizations to develop a working relationship with PBS that would have included increasing their employment of Latinos have met with stonewalling on their part, refusing even to release the number of Latinos they currently employ, unlike their commercial counterparts! Given this track record, it is no surprise that the producers of Latino Americans were forced to attempt to make up for this historic neglect by stuffing so much into this particular documentary. As Latino Americans airs during Hispanic Heritage Month, it is important we pay attention not only to the history it presents, but PBS’ own poor history with the Latino community. While we should bestow upon it this documentary all the accolades it deserves, this one act should not absolve PBS of its failure to meet its goal to, according to their mission statement, “addresses the needs of unserved and underserved audiences” when it comes to the Latino community. Perhaps the presentation of Latino Americans can reopen a long overdue dialog with PBS and its parent Corporation for Public Broadcasting about the need for a new accountability to the Latino community. Nonetheless, my hope is that despite its shortcomings, this documentary will provoke a necessary and healthy dialogue among diverse Latino nationalities (entre nosotros) and assist the general public in acquiring a better and more empathetic understanding of the Latino experience. Angelo Falcón is President of the National Institute for Latino Policy (NiLP). He would like to thank Howard Jordan and Gabriel Haslip-Viera, the co-chairs of the Film Review Committee of The Boricua Film Club for their helpful comments on this review. Angelo Falcón can be reached at afalcon@latinopolicy.org.